We started with some fresh oysters on Christmas Eve, which is usually more important in France than Christmas Day lunch (this one was low-key though, as there were still only a few of us). 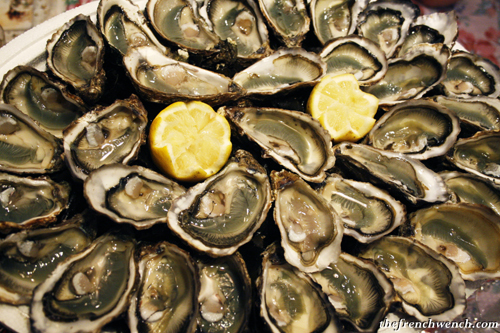 The oysters were accompanied with a few drops of lemon juice, which for me is the best way to eat them, except maybe with an eschalot vinaigrette. We also had scallops, which I omitted to photograph, cooked in a creamy sauce, then a lot of cheese and of course the Chocolate Bûche my mother had made (see previous post). On Christmas Day we had a bit of a drama as we had to wait for what seemed like an eternity at Valence TGV train station, a huge windy freezing place in the middle of nowhere, while my sister and her two tired and hungry kids were blocked for an extra 3 hours in the train due to the weather conditions (snow, freeze…). It actually wasn’t too bad, compared to other parts of France: a few days later, hundreds of travellers got stuck for 26 hours (!!!) in a train from Strasbourg to Nice… Aaaaaaaah, the joys of train travel! Meanwhile at home, some guests (I won’t say who 😉 had started on the “apéro” to pass the time and as a result were starting to be a bit tipsy by the time we came back! It was well past 5pm when we finally sat down to lunch, everyone was starving and we just demolished the food! We started with a bit of Foie Gras, eaten with slightly toasted bread, followed by the traditional “Dinde aux marrons” (Turkey with chestnuts). My mum was a bit worried that the turkey would end up being too dry, having stayed in the oven much longer than planned and then out on the kitchen table for a while longer, but it was just perfectly cooked! A little Christmas miracle 😉 It was stuffed with chestnuts and accompanied with a stew of chestnuts & apricots, an unusual but pleasant combination, and green beans and potatoes… and gravy, lots of it! Simply delicious. 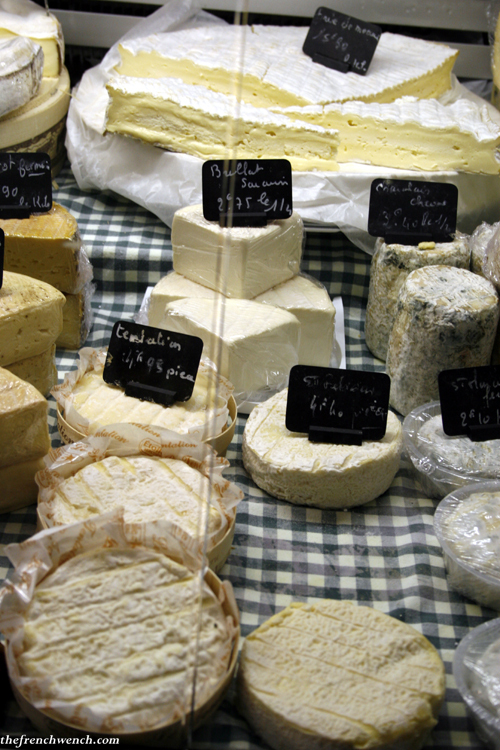 We then moved on to the cheeses… My cousin had set herself the mission to bring me the smelliest cheeses she could find, assuming Australian cheeses must be pretty bland and that I would crave a good authentic French stinker! She brought the two babies below, probably the smelliest cheeses I have ever encountered! There actually was a third cheese she had bought that we had to throw away, even she couldn’t eat it… and she has a very high smelly cheese threshold! This one was a pretty far gone Époisses, though I found that if I stayed clear of the crust, it was still quite enjoyable with a robust glass of wine! 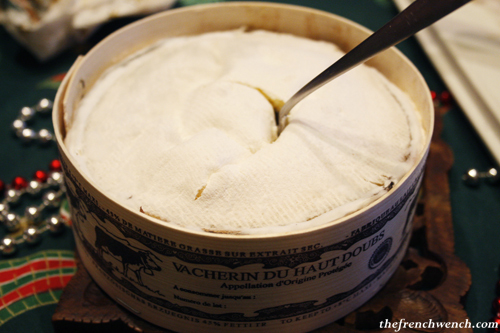 We were also spoilt with some Vacherin du Haut-Doubs (where I was born), very nice and smelly but not overly so. That is the kind of cheese in which you dig a hole, pour some white wine into it, leave in the oven and eat later with a spoon… but we didn’t do that this time, we were quite content to just spread it on some nice Campaillette, an artisan baguette from one of the most popular bakeries in town, la Boulangerie Bédouin. 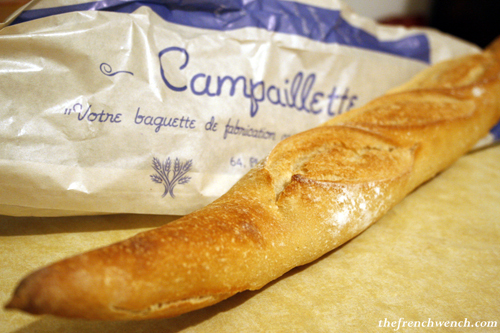 My mother used to send me there to get the bread when I was a kid, and my big pleasure was to tear a big chunk from the still warm baguette and eat it on the way home. By the time I was coming back, half of it would have been eaten… my mother was not impressed! I also got to eat some nice Morteau Sausage for my birthday lunch. “Saucisse de Morteau” is a pretty strong flavoured sausage from the Jura Mountain (my birth place). 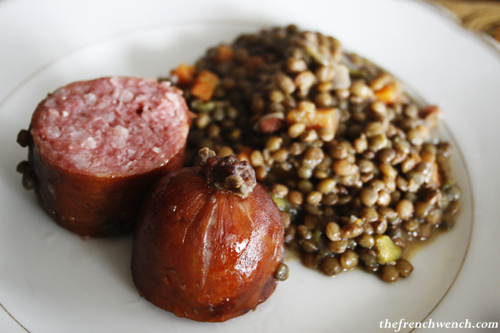 It is really delicious, served hot with a mixture of lentils, carrots and a bit of speck… I had to restrain myself to not help myself a third time! Another item on my list were my beloved Ravioles de Romans, a type of small ravioli filled with Comté, fromage blanc, eggs, parsley, butter and salt. They are delicious just quickly boiled and sprinkled with grated cheese, or “au gratin”, as I could have shown you, had my camera reflex been quicker than that of my stomach! However, I am determined, one day, to make some at home myself, thanks to a cookbook my sister gave me for Christmas entirely dedicated to Ravioles. So stay tuned, because as soon as I receive my little mould from France, I will go wild on the ravioles! Also on the list were Quenelles, oval-shaped dumplings made out of fish (mostly pike) or chicken paste and bound with egg. 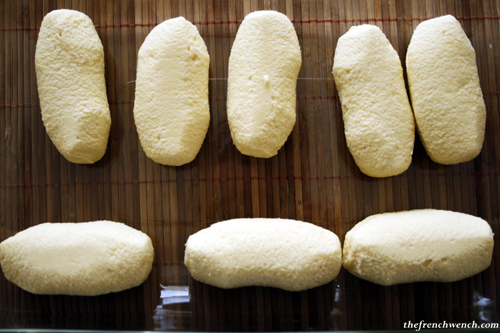 The ones made out of pike, “Quenelles de Brochet“, are a specialty of Lyon and Nantua. You can also find vegetarian plain ones, as pictured above, which were cooked in a creamy tomato sauce. 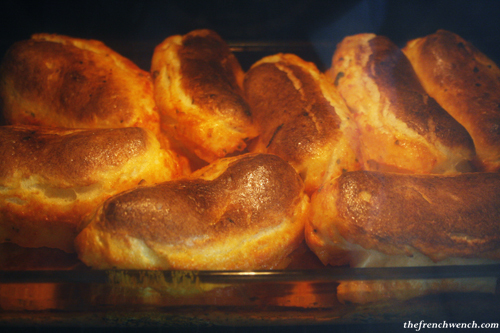 They really expand during cooking, which makes them quite light and airy. Like the ravioles, I will explore the subject further in a future post and try to make them myself… I’m gonna be a busy bee! Here is another type of Quenelle, sweet this time, and a specialty from Lyon Chocolate maker, Voisin Chocolatier. 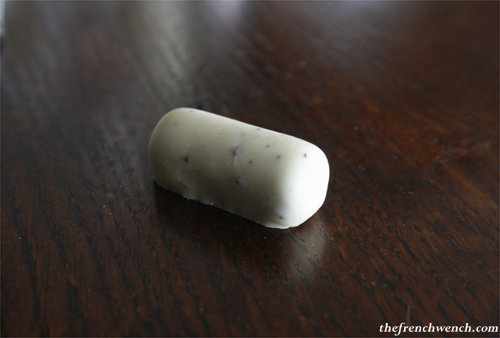 It consists of a soft hazelnut praliné covered with a fine layer of white chocolate. 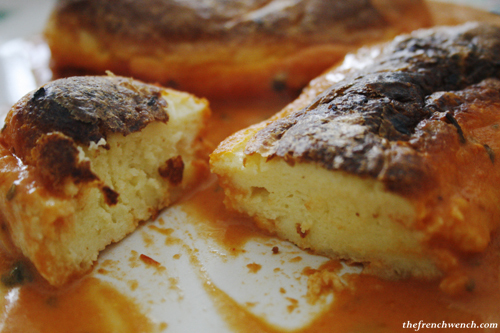 The fine piece of confectionery above is called Coussin de Lyon, in English, Pillow of Lyon. As the name suggests, they are another Lyon specialty and are made exclusively by Voisin Chocolatier. It is made out of a soft dark chocolate ganache centre flavoured with Curacao coated in an emerald green almond paste/marzipan layer. 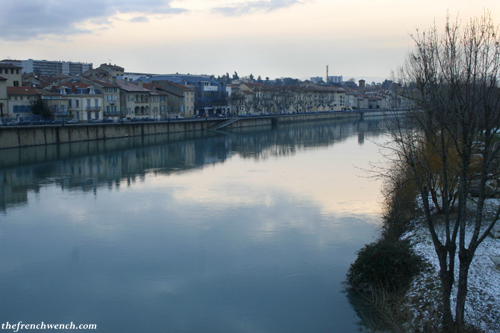 It was shaped like a pillow to evoke a silk cushion, as Lyon was very renowned for its silk industry. 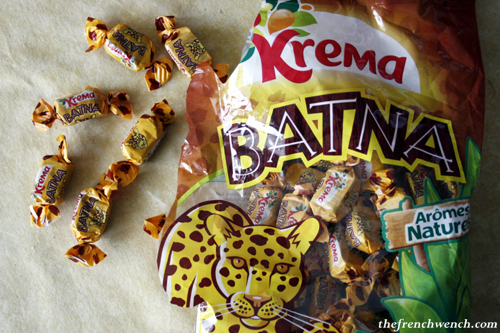 Kréma’s Batna is a soft and creamy lolly tasting like a mix of caramel and liquorice, another one of my all time childhood favourites. Our parents used to like them too, as they used to keep us quiet at the back of the car on the long hard road to summer holidays. 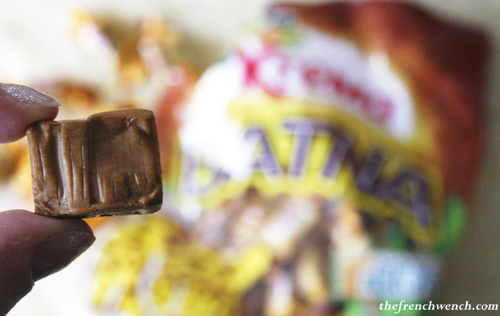 I could eat a lot of them in a row… and I still do! (Yes, that is glittery polish you can see on my nails, I was fully immersed in the Christmas spirit). Calissons d’Aix are made from an almond & candied melon/orange paste, shaped like an almond and coated with white icing, they are a specialty from Provence region. These ones were sprinkled with gold and silver powder for the festive season. 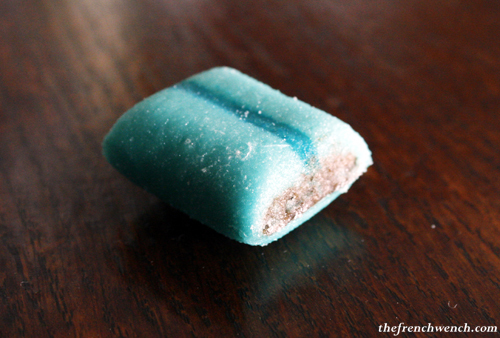 Apparently the word “Calisson” would come from the Provencal dialect “câlin’, meaning “hug”… pretty cute! These were made by my friend’s mum, Solange, and we call them Bugnes. 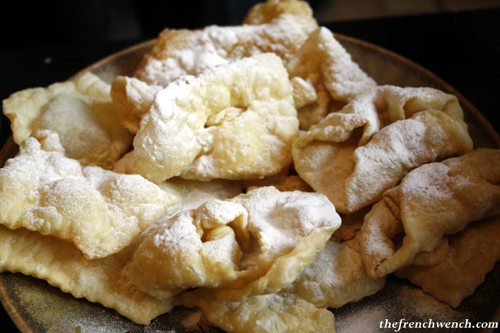 They are more commonly known in Australia by their Italian name, Crostoli. Ideal with afternoon tea! 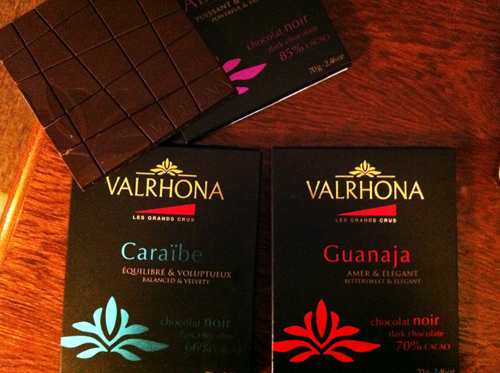 We will finish with a bit of Valrhona chocolate, one of the best, if not the best chocolate in the world. 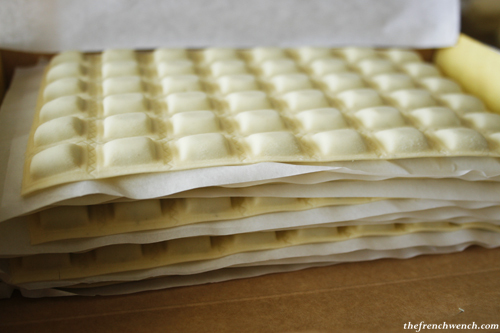 I like the shape of the chocolate “squares”, you can choose whether you feel like a small or bigger piece. I recently watched a documentary called “Les Toqués du chocolat”, where you could follow the life of several chocolate specialists, including Vanessa Lemoine, a “nose”, or Sensorial Analysis Manager at Valrhona, who works with chocolate as an oenologist would with wine, it was quite fascinating. You can see this documentary (unfortunately in French only) on Christophe Michalak’s website. Voilà! 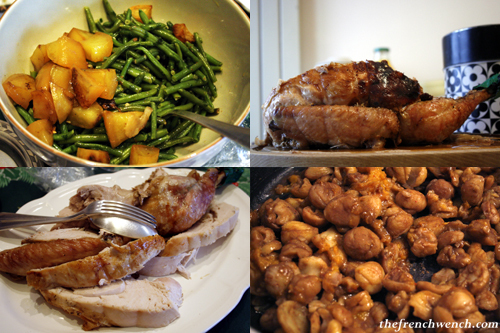 I hope I didn’t try to squeeze too much into the one post and that you enjoyed this glimpse into my French Christmas, à bientôt! 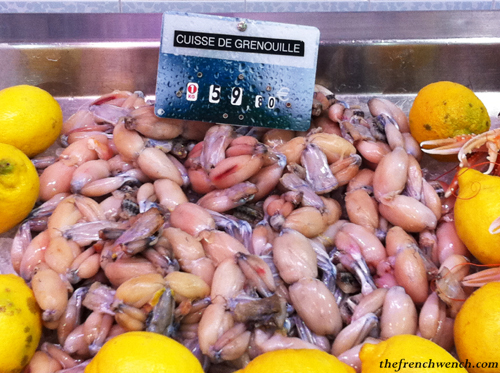 This entry was posted in French Specialties, Travel and tagged Époisses, Baguette, Camembert au Calvados, Campaillette, Dinde aux marrons, Foie Gras, Frog Legs, Oysters, Quenelles, Ravioles, Romans-sur-Isère, Saint-Félicien, Vacherin. Bookmark the permalink. You are killing me with this. 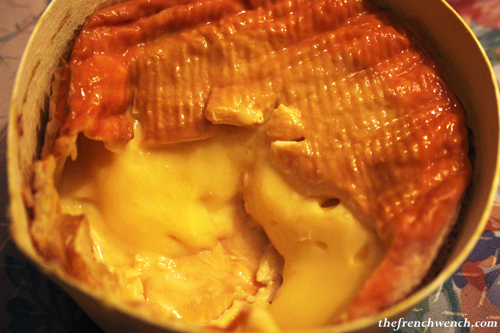 Combining so many of my favourite French foods in one post – then the cheeses and calissons ! What am I going to do now to get my fix?? I like how you said ‘we started with a bit of foie gras’ and then you show a pic with great big chunks of it! The cheeses look amazing. I shall stop drooling now. Wow, what a wonderful fantastic experience! 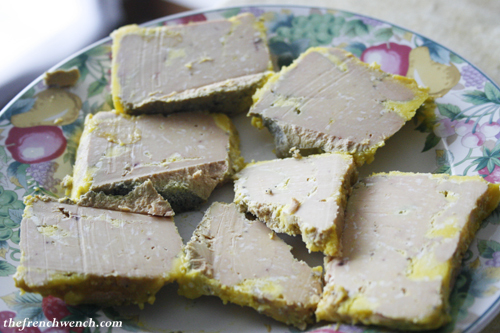 Duck Foie Gras all the way for me! This is so gorgeous… Makes me miss Europe even more!